Lisa Moizer is the Strategic Coordinator for Lancashire Enterprise Partnership's Skills and Employment Hub. 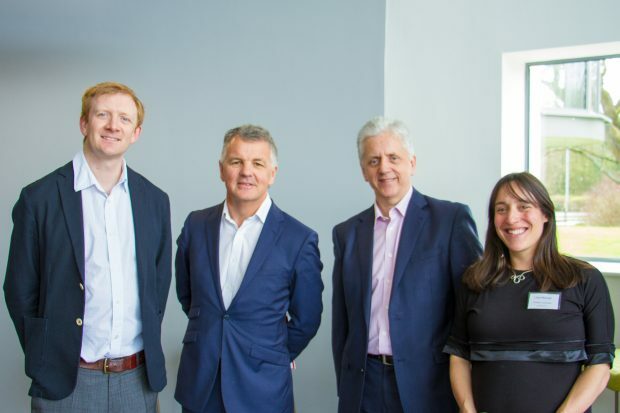 From left to right: Richard Keelty (Google), Phil Smith (Tech Partnership), Mike Blackburn OBE (GM Local Enterprise Partnership), and Lisa Moizer (Lancashire Enterprise Partnership), at the Lancashire Local DSP launch. Fast forward to 18 April and I'm standing in the impressive foyer of EKM, one of our key digital businesses in Lancashire, on an unseasonably warm and sunny day; we are about to welcome a fantastic host of digital stakeholders to our Lancashire Digital Skills Summit, and to launch Lancashire’s Local DSP – the first in the country. The Framework encompasses a focus on the digital sector and digital skills, as this is a priority for the Lancashire economy: not only is the sector Lancashire's fastest growing (and projected to continue growing significantly), but we also recognise that digital skills underpin the potential and wellbeing of people and businesses in Lancashire across all sectors. Expert: Lancashire businesses have access to skilled people to enable them to drive digital innovation and be at the forefront of Industry 4.0. We have directed investment and resource toward digital skills and employment activities in the county that meet identified needs across these three levels of digital skills. Investment has come from a variety of funding sources, including European investment funds, skills capital, and the Careers Enterprise Company. We have also built a network of public-, private-, and charity-sector organisations, which has enabled us to have an informed approach to address our digital skills needs. It was this network that we called upon to come together to launch our Local DSP alongside DCMS. Feedback from delegates was incredibly positive: everyone was excited about our achievements and the potential of what we can accomplish together going forward. Delegates also said how important it is to maintain the enthusiasm and momentum that had been built. An issue raised several times throughout the day was that Lancashire doesn't ‘blow its own trumpet’ enough, and that we should try to improve communication of our agenda and our achievements within the county – we have to work on doing this nationally as well. It is now essential that we develop our best practise locally: growing and sustaining projects that have an impact, as well as bringing on board corporate support and national policies in a coherent and collaborative way. This will mean that we are consistently adding value to the local picture and continuously learning. Google, TSB, Lloyds, and Freeformers have already agreed to provide support to digital skills training in Lancashire through the partnership; Google has committed to work with local partners to train 1,000 people and businesses through its Digital Garage programme. We need to continue to work closely with DCMS to support the development of their 'Playbook'. We also need to ensure that we take up corporate support opportunities and Government initiatives to test new models and ideas, as well as proactively sharing our experiences with areas who wish to set up their own Local DSPs across the country. See some of the press releases here: BusinessCloud.co.uk, Lancashire Skills Hub. Follow us on Twitter @LancashireSkillsHub (and our associated hash tags: #LancsDigiSummit, #InspiringLancashire and #UpskillingLancashire).